Native to East Africa and relative of the Plumeria. 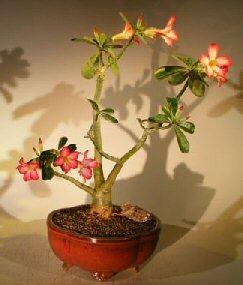 Small succulent tree that grows only about 8 inches tall in the wild, has fleshy leaves and forms a very bulbous base. 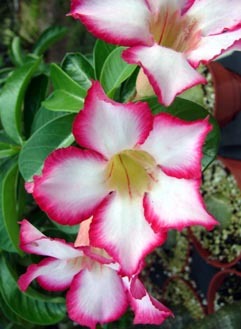 Produces exotic 2" pink and white, open-trumpet shaped flowers throughout the year in full sun. Needs little water during winter. All plant enthusiasts love these. 11 years old, 12" - 15" tall. Suitable humidity/drip tray is recommended. To purchase add $8.95.